When it comes to animals that fascinate us, few do so as frequently as big cats. There’s the ferociousness of the African Lion, prides of which have been known to take out Elephants. There’s the athletic prowess of the Cheetah, which can reach speeds of 65 to 75 miles per hour. There’s the Royal Bengal Tiger, the largest of the big cats and arguably the most iconic of all Indian animals. But of all the big cat species, the Amur Leopard is the rarest wild cat in the world. With around 100 individuals left in a 3,242-square-mile area along the border between Russia and China, these comely cold-climate cats are currently listed as Critically Endangered. As much as we may love the likeness between the massive beasts of the Panthera genus and our household pets in terms of their appearance, movement, and personality, the truth is that big cats are in serious trouble. Popular TV shows such as Big Cat Diary may help draw attention to these spectacular species, but several large cats have recently gone extinct, and many of our favorites are struggling to survive. There are 16 big cat species on the IUCN Endangered List, all but one of which is from Asia (including the Critically Endangered South China Tiger, Sumatran Tiger, and Asiatic Cheetah). Of the world’s nine subspecies of leopard, six are either Endangered or Critically Endangered. Unfortunately, most of these awesome Asian animals are not nearly as well known as their African cousins. 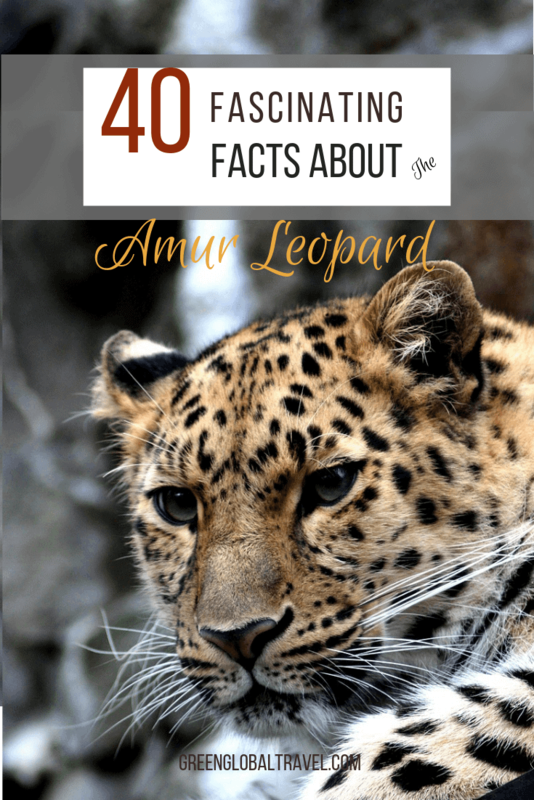 So let’s dive into some fascinating Amur Leopard facts, from their current population and preferred habitat to why they’re endangered and what’s being done to save them. 1. The Amur Leopard is also known as the Russian Leopard, Far East Leopard, the Manchurian Leopard, and the Korean Leopard. Also included in this list of names is the North-Chinese Leopard, which was formerly recognized as separate subspecies. Whatever we choose to call these amazing animals informally, their official scientific name is Panthera pardus orientalis. 2. Wondering why they’re called the Korean Leopard when they’re only found in China and Russia? 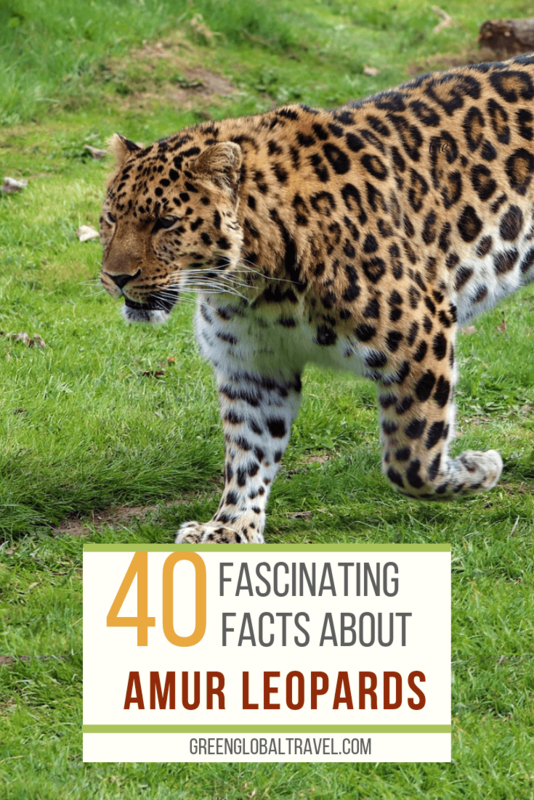 That’s because the first known documentation of the Amur Leopard was in Korea in 1857, when German zoologist Hermann Schlegel discovered a pelt. 3. Amur Leopards are distinctive from other leopards because their fur tends to be thicker and sometimes paler– almost a creamy yellow color– than that of the other subspecies. 4. Like all leopards, Amur Leopards have spots (called “rosettes”) that cover their heads, backs, tails, and legs. These rosettes are roughly two inches square and black. On the Amur Leopard, they’re spaced a bit further apart, with thicker swabs of black than other leopard species. 5. Both genders of the Amur Leopard are typically somewhere between 42 and 54 inches long and 25-31 inches tall at the shoulder. Their tails add another 32-35 inches to their overall length. 6. Despite being similar in size, Amur leopards are sexually dimorphic, with males naturally a bit heftier than the females. Males average within the range of 70-110 pounds; females are a bit less bulky, averaging between 55 and 75 pounds. 8. 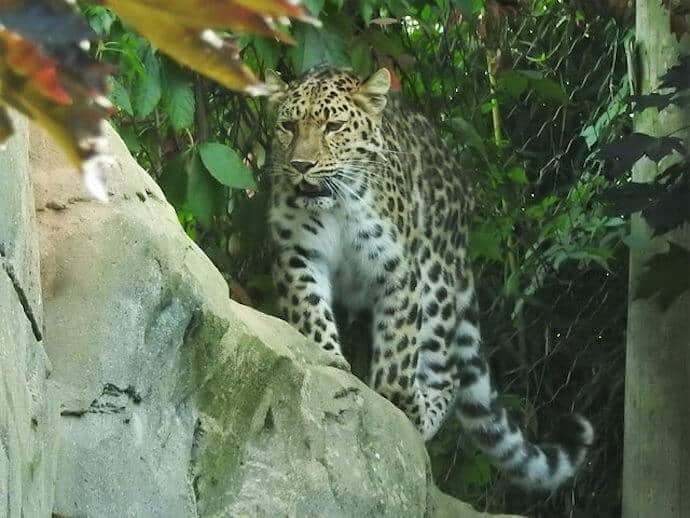 Nowadays, the majority of Amur Leopard habitat is in the mountains of the Russian Far East (Primorsky Krai) and Northeast China (Jilin and Heilongjang). There are some reports that they’ve been spotted in North Korea as well. But the last verification of an Amur Leopard in South Korea was 50 years ago, when one was captured on Odo Mountain. 9. The animal’s name comes from the Amur River, the 10th longest river in the world, which flows into the sea in eastern Russia and forms part of the border with China. Amur Leopards inhabit areas both north and south of the river. 10. Due to the temperate climate of their habitat, these leopards have summer fur that is just under an inch thick. In the winter their fur thickens to over three inches in order to stay warm. The cats also have paler coats than other leopards in order to help with camouflaging them in the snow. 11. Another evolutionary advantage that has helped these leopards survive in snowy environs is the fact that their legs are a little longer than other leopards, and their feet are a little bigger. This better equips them for walking, prowling, and hunting in the snow. 12. Like many big cats, Amur Leopards are nocturnal. During the day, they often sleep in caves or under cover. They wait for the added advantage of nightfall– particularly at dusk and dawn– for hunting. Cats’ eyes are geared to be effective for night vision, and aren’t nearly as good in the daylight. 13. The territory of a single Amur Leopard can be enormous, covering nearly 120 square miles. This is around 75,000 acres, or more than 55,000 football fields! While they roam such large areas, the cats are also known to be highly territorial. In other words, there needs to be a lot of wild terrain in order to maintain a healthy population. 14. With such large habitats and intense territoriality, these big cats are relatively solitary until it’s time to breed. During mating season, many males will follow a single female leopard and fight over her for the right to procreate. 15. Like most big cats, Amur Leopards are extremely athletic. They can run nearly 40 miles per hour. They can jump almost 20 feet horizontally and up to 10 feet vertically. After hunting their sizable prey, they have the strength to carry carcasses to hide them from other predators. 16. Amur Leopards are carnivores through and through. Like other cats, they have rough tongues that are covered with denticles, or tiny hooks, that are used to scrape meat off the bone. Keep that in mind the next time you think how cute it is when your house cat is licking your hand! 17. Amur Leopards mainly eat deer, of which there are several varieties in their habitat range. Siberian roe deer and Manchurian sika deer are their main pray, but Siberian musk deer, Manchurian wapiti, and Amur moose (the largest animal in the deer family) are also on the regular menu. 18. When necessary, the Amur Leopard diet expands in some interesting directions. They will hunt wild boar, badgers, birds, mice, and hares. They have even been recorded hunting young Asian black bears in the Kedrovaya Pad Nature Reserve. 19. These leopards sometimes share space with Siberian Tigers (a.k.a. Amur Tigers), which compete for prey. Unfortunately, tigers are more than twice the size of Amur Leopards, and much stronger. But tigers prefer wet, lowland areas, whereas Amur Leopards prefer mountainous terrain. Amur Tigers were once on the brink of extinction, with less than 50 left, but made a significant comeback in the latter half of the 20th century. 20. There is observational evidence that these leopards practice seasonal breeding. This happens in late winter, so that Amur Leopard cubs are born in late spring or early summer, after the frost subsides. Female leopards can only procreate for 10-15 days during that time. 21. Amur Leopards gestate for approximately 12 weeks, and they give birth to litters of one to four cubs. 22. 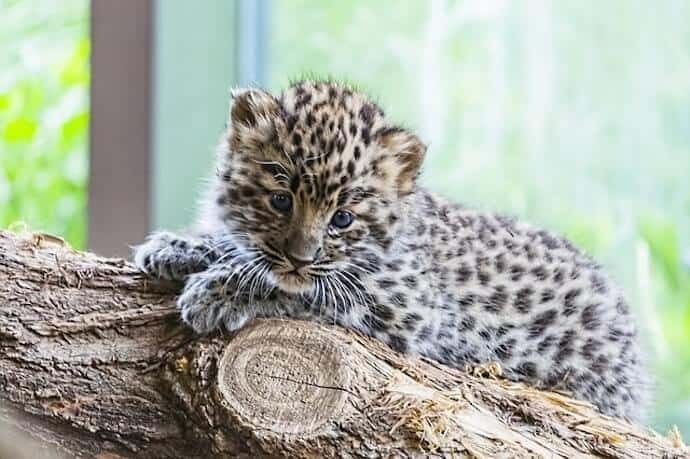 Baby Amur Leopards weigh less than two pounds at birth. They are born blind and start moving around after about two weeks. By the time they’re a few weeks old, they’re already eating meat. Amur cubs stay with their mothers until they’re two years old, and by the time they’re three or four years old they’re ready to have cubs of their own. 23. Like many animals, Amur Leopards live slightly longer in captivity than they do in the wild. The average lifespan of a wild leopard clocks in at somewhere between 10 and 15 years, but they’ve been known to reach 20 in captivity. Unfortunately, there are currently more captive Amur Leopards than there are in the wild. 24. 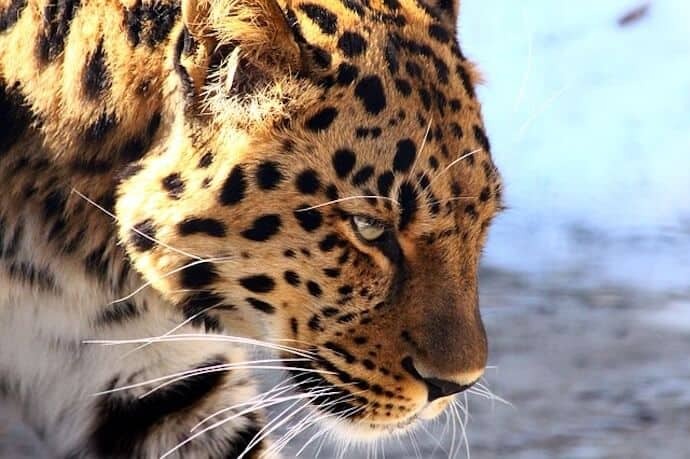 According to most sources, the 2018 Amur Leopard population was less than 100 individuals. And many of these are scattered too widely to have a viable chance at repopulation. There are roughly double this amount (around 200) in captivity, mostly in zoos throughout Europe, North America, and the former Soviet Union. 25. Amur Leopards are considered the most endangered cats on the planet, in part due to poaching. Because their pelts are strikingly beautiful, they fetch $1000 or more on the black market. Some villagers, who moved nearer to leopard habitat in search of agricultural land, still hunt them for money (despite the fact that the rarest leopard species is protected by CITES). 26. The destruction of Amur Leopard habitat for the purposes of development has arguably been even more damaging than poaching. Illegal commercial logging and large-scale agricultural expansion have decimated the temperate forests these animals have roamed for centuries. With inadequate territories, Amur Leopards are struggling to find enough space to live fruitfully. 27. Humanity is causing other issues for the animals as well. Much of these mountain forests have been felled in order to raise domesticated animals for human consumption. Adding to the problem are villagers who hunt Roe and Sika Deer to sell and/or eat. Unfortunately, this encroachment comes at a steep price for the Amur Leopard diet. 28. Climate change is another contributing factor in reducing the suitable habitat for Amur Leopards, simultaneously causing a further decrease in prey. 29. Having virtually the same diet and sharing the same space, on rare occasions Amur Tigers will actually prey on the much smaller Amur Leopards in order to reduce competition for food. As the food supply continues to dwindle, this kind of thing might become more problematic. 30. Another challenge is that these endnagered animals have a particularly low level of genetic variation. 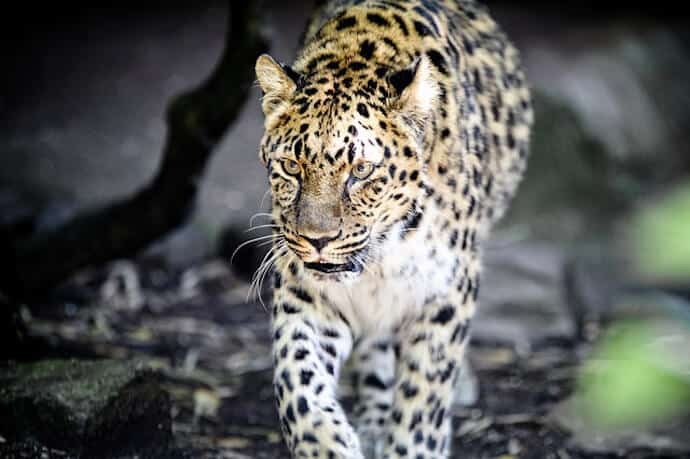 With Amur Leopard population numbers already dangerously low, one simple virus could potentially wipe out many of the existing individuals, because none of them may have the right immune system to withstand the infection. 31. The creation of Land of the Leopard National Park is perhaps the most significant stride in Amur Leopard conservation to date. In 2012, the Russian government set aside some 650,000 acres of taiga forest land that includes 60% of the leopards’ habitat, and all of their breeding grounds. The Russian national park is also home to 10 Amur Tigers. 32. Formerly known as the Amur Leopard & Tiger Alliance (ALTA), WildCats Conservation Alliance now leads a concerted effort to protect wild populations of Amur Leopards and provide aid for building their capacity to sustain themselves. The alliance also provides funding for breeding programs in European, Australasian, and North American zoos. 33. 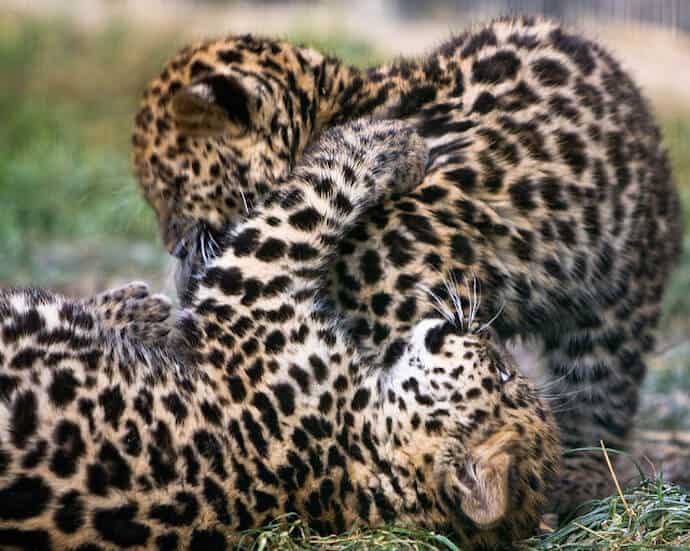 World Wildlife Fund was instrumental in lobbying Russia to create the Land of the Leopard National Park as a safe haven for Russian leopards and other animals. Additionally, WWF monitors Amur Leopard populations via camera traps and works to increase their prey populations. WWF has also supported anti-poaching efforts and programs to stop the illegal trade of Amur Leopards and other endangered species. 34. 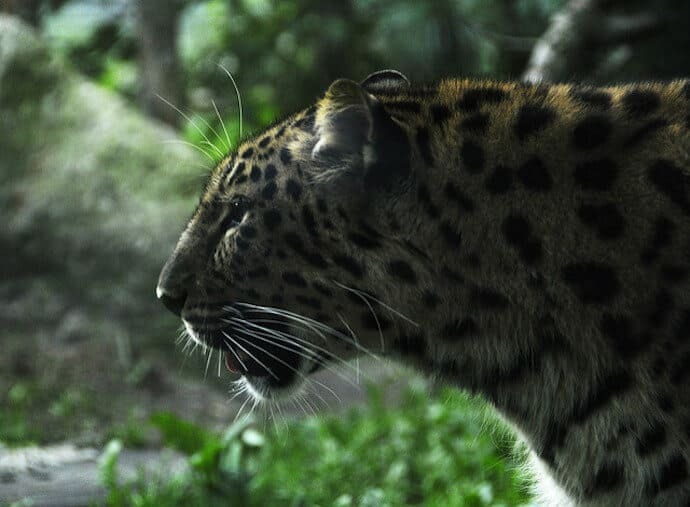 In conjunction with other organizations, including the Russian Academy of Science, TIGIS, Tigris, and the Phoenix Fund, Wildlife Conservation Society Russia is working to collect biological data, monitor Amur Leopard populations, gauge the effects of fire on their habitats, and thwart illegal poaching of the animals. 35. The Zoological Society of London has been aiding in Amur Tigers and Amur Leopard conservation efforts for over a decade now. The society works with local law enforcement to prevent illegal trade, as well as helping with health monitoring for the animals. 36. 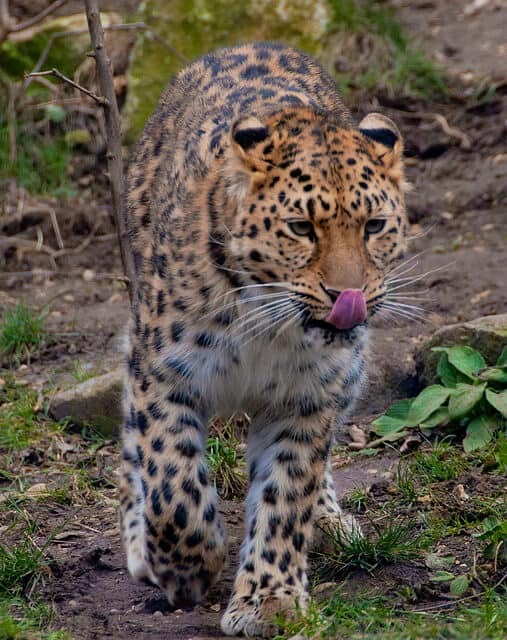 Is the Amur Leopard extinct? Amur Leopards are not extinct yet. But they are critically endangered, the classification for the animals most at-risk of going extinct. They were put on the IUCN Red List under this classification in 1996. Thankfully, the wild Amur Leopard population has increased slightly since then. 37. How many Amur Leopards are left in the world? Less than 100 Amur Leopards are left in the wild. Some censuses report their populations as low as 60 individuals, while others have it at approximately 100. There are approximately 200 more in captivity in various zoos around the world. 38. What do Amur Leopards eat? Amur leopards are opportunistic carnivores, so they’ll eat/hunt just about any meat that’s available, including young Asian Black Bears. However, their main sources of food are Sika and Roe Deer. They’ll also eat Wild Boar, Badgers, Moose, and Hares. 39. Where do Amur Leopards live? Amur Leopards live in Eastern Asia, primarily in Russia and China, though some reports indicate there may still be some in North Korea. They live in the mountains, in broadleaf and mixed forests. Their common name, Amur, actually references a river along which most Amur Leopards live. 40. How many Amur Leopards are in captivity?